IC card gas meter has organically integrated traditional mechanic gas meter with high performance circuits, which remains metering accuracy of mechanic meters and at the same time realizes automated management. The IC card gas meter, with compact structure and advanced technology, is convenient to operate and reliable in usage. IC card gas meter is a main device which helps city gas companies and gas users realize the scientific and automated management of supply and use. The IC card has prepaid function and the credit and surplus credit can be displayed through the LCD. 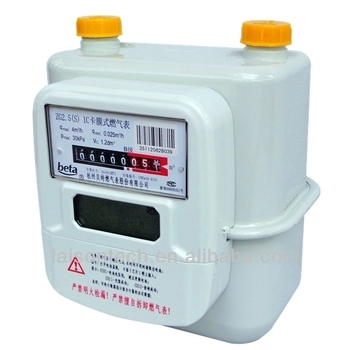 IC card gas meter is applicable for the metering of artificial coal gas, natural gas, and liquefied petroleum gas.